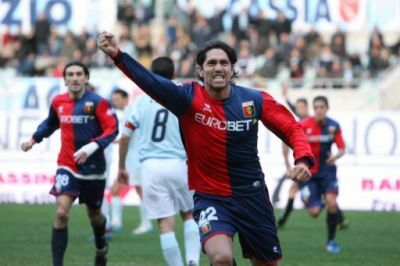 Mille grazie Marco Borriello for all goals ! Anche mille grazie tommy1893 for making this great video with 18 of the 19 goals (the goal against Torino in Luigi Ferraris is not in the video) of our topscorer. Let’s hope Marco returns in January just like Domenico Criscito last year. After weeks of speculation in the newspapers, on radio, tv and internet tonight Genoa’s President Enrico Preziosi spoke the words we all don’t want to hear: Marco Borriello goes back to A.C. Milan. To have their 50% of Super Marco back Milan has to pay € 9 million and 50% of young very talented playmaker Davide di Gennaro. The young midfielder celebrates on the 16th of June his 20th birthday and he already played 1 match in Serie A with Milan in the season 2006-2007 and 21 matches with 2 goals this year in Serie B with Bologna. Davide also plays for many years with the Italian national youth-teams. 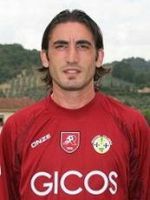 Genoa today also bought Francesco (Cicco) Modesto of Reggina. The 26 years old left midfielder this season played 32 matches with 1 goal in Serie A, while he also was a line-up player in the highest league in Italy with the team of Reggio Calabria in the seasons 2006-2007 (35 matches with 2 goals) and 2005-2006 (37 matches, no goals). Because of the arrival of Modesto probably 1 of the Brazilians: Fabiano or Danilo leaves Genoa. On the internet circulates the news that tommorow there will be the other long expected meeting with Juventus to talk about Criscito, Paro and several players of Juventus that Mr. Gasperini wants to have in our team next year. Last Monday Genoa’s president Enrico Preziosi told that after the € 17 million of last year he wants to spend € 30 – € 35 million this summer to have an even better team as last season with the hope to reach Uefa-cup football at the end. Let’s hope his wish will be true. For a lot of people the transferperiod is just as interesting as the football itselves. Especially in Italy there is always a lot of news about transfers and not more than 5% of the news is really true, but which 5% ? With Genoa Marco Borriello and Abdoulay Konko have a lot of interest from other (big) clubs, so it will be very difficult to keep these players in Genova. 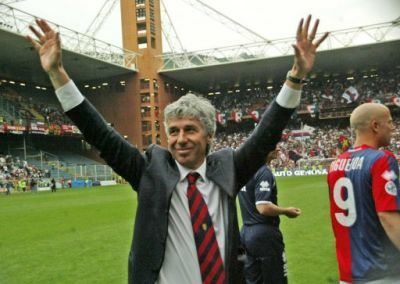 On the other hand Mr. Preziosi and Mr. Gasperini promised the Genoa-fans a more better team then last year. Just like every team in Italy also Genoa has a lot of players which are only for 50% owned by the club. Before 6th of June the clubs that own the players has to make a deal about the player. Some clubs already fixed the price of the player at the moment they sold 50%, for instance with Criscito the price of the 50% of Juventus is € 6,5 million which Genoa has to pay if they want to keep the young talented defender. With other players there is no amount in the contract and the clubs have to talk about the price of the other half. For instance 50% of Marco Borriello was bought by Genoa last summer when Preziosi payed € 2 million to A.C. Milan. Now being an Italian national player and 19 goals in Serie A later the value of Marco Borriello is raised till around € 20 million, which means that if you want to have Marco Borriello completely you have to pay around € 10 million to the other owner. Probably Genoa finds this too much, so Borriello goes back to A.C. Milan that pays Genoa the large sum of money to have the other 50% of Super Marco. In that case Mr. Preziosi made a benefit of € 8 million in 1 year which he can use to buy new players or for instance to pay Juventus to have the other 50% of Criscito and Paro. Genoa owns a lot of players for only 50%: Criscito, Bovo, Santos, Paro, VandenBorre and Borriello that played with them last year and Coppola (Siena), Forestieri (Siena), Papa Waigo (Fiorentina) and Masiello (Bari) who played with the other teams. Before the 6th of June there must be a deal between the 2 clubs and if they don’t find a solution both teams have to write down the price they want to pay to have the other 50% in an enveloppe which they have to give to the Football Association that opens them and the team who wrote down the highest price has to pay that price to the other team. This afternoon Italian national trainer Roberto Donadoni (the first 3 matches of the season 2003-2004 trainer of Genoa in Serie B) selected 24 players from which 23 go to Euro 2008 in Austria and Switzerland. Italy plays with Holland, France and Romenia in Group C and starts at Monday 9th June against Holland. Trainer Donadoni selected 6 strikers: Borriello (Genoa), Cassano (Sampdoria), Del Piero (Juventus), Di Natale (Udinese), Quagliarella (Udinese) and Toni (Bayern Munchen). Before Wednesday 28th June 1 player has to be send home because the list of Euro 2008 has a maximum of 23 players. 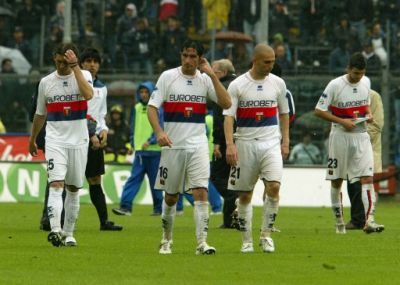 Without 6 line-up players: Rubinho, Bovo, Criscito, Rossi, Paro and Sculli the team of Mr. Gasperini also lost the last match of the first season in Serie A after 12 years. This victory also brought opponent Atalanta 48 points, which makes them 9th in the standings because of the goal-difference, just before Genoa on the 10th place. In the 32nd minute ex-Genoa player Sergio Floccari opened the score in rainy Bergamo. Just before halftime our defender Gaetano de Rosa was close to the equalizer, but Capelli saved the header on the line. In the second half both teams had chances to score but after both Danilo in the 66th and Milanetto in the 79th minute got their second yellow card Genoa only had 9 players in the field. Despite the 2 extra players it lasted till the 93rd minute till Marconi doubled the score: 2-0. Despite the fact that A.C. Milan owner of 50% of Marco Borriello wants him back in San Siro next year and several other big clubs in Italy and England offer very good contracts, Marco Borriello prefers to stay with Genoa. Hopefully Genoa can pay the enormous amount to A.C. Milan (around € 10 million) to buy the other 50% of the topscorer in Serie A. Especially the trust that president Enrico Preziosi had in him last summer when he spend € 2 million to buy 50% of the transfer-rights of Marco Borriello to A.C. Milan makes Marco’s wish to stay in Mr. Gasperini’s red and blue team. Sunday in the last match of the season in Bergamo against Atalanta Genoa has to miss surely 5 injured players: Paro, Masiero, Vanden Borre, Criscito and Sculli. It looks like Rubinho and Danilo can recover in time. 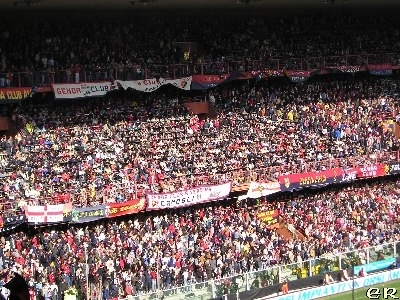 Genoa has reached the 7th position with the number of supporters in their homegames this season. Besides the 21.675 seasontickets there was also an average of 3.070 single-tickets every match. The most visited match, of course, was the derby with 31.618 supporters, Juventus with 28.151 on the second place just before Inter with 27.624 fans. 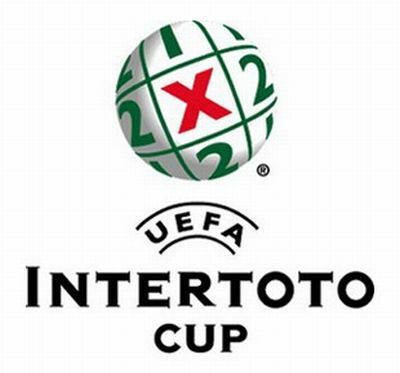 The match against Siena at 9th December 2007 took “only” 22.697 supporters and was the less visited one. 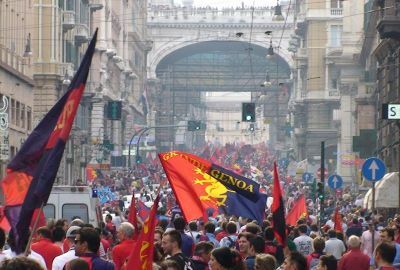 Last year in Serie B Genoa had an average of 19.934 supporters, which means an increase of 4.811 fans (+ 24,13%). 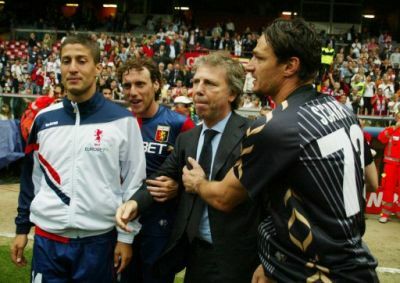 Unless the 0-2 defeat by Lazio (goals of Pandev and Rocchi in the first half; Konko hit the post in the second half) Genoa’s president came for the first time since the famous match against Venezia on 11th June 2005 on the field. As you can see on the foto he first was a little nervous, but the great public in Luigi Ferraris helped him immediately. At the end of this fantastic first season after 12 years in Serie A we maybe don’t reach Uefa-cup but the club has solved all the internal problems of last years and is ready to improve next year in Serie A and reach European football easily. Defenders: Bovo, De Rosa, Ghinassi, Lucarelli, Santos. Midfielders: Danilo, Fabiano, Juric, Konko, Milanetto, Raggio Garibaldi, Rossi, Torres. Strikers: Borriello, Figueroa, Ledesma, Sculli, Wilson.